Stephen Tobolowsky is a character actor, appearing in small roles in several films every year. He's balding, middle-aged, pudgy, and white -- utterly forgettable, really -- but like the best character actors, chances are you remember him without even knowing it. In Groundhog Day, he was Ned Ryerson, the annoying insurance salesman who pestered Bill Murray every morning. In Mememto, he was Guy Pearce's doppelganger. In Single White Female, he was Bridget Fonda's leering boss. In Sneakers, he was the "Passport?" guy. In Thelma & Louise, he was a dogged FBI agent. In Spaceballs, he was Captain of the Guard. He co-wrote David Byrne's True Stories, and wrote and directed the bizarre but rarely-seen "make me a star" story Two Idiots in Hollywood, based on his own play. He directed Holly Hunter in the original New York stage production of The Miss Firecracker Contest. 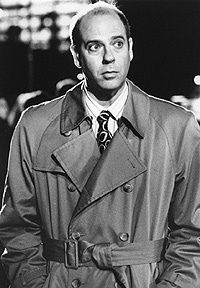 Tobolowsky has appeared in dozens of movies, from Swing Shift to The Insider, Adaptation to Freaky Friday to Freddy Got Fingered. On the small screen, he's done Seinfeld, Mad About You, The Practice. Law & Order: Criminal Intent, The Drew Carey Show, among many others. He was a high school friend of Stevie Ray Vaughan, sang in Vaughn's first amateur band, and had a long relationship with playwright Beth Henley. His aunt, Hermine Tobolowsky, was a feminist and activist, who led the movement to add the Equal Legal Rights Amendment to the Texas Constitution (adopted in 1972). He is also a distant relative of 1960s schlockmeister Edwin Tobolowsky, producer of Zontar: The Thing from Venus, Mars Needs Women, and In the Year 2889.